This is not so much a review as an article based on an interview with Paddy Moloney in the Autumn of 2002. Time passes quickly in a conversation with Paddy Moloney, not just through the pleasure of chatting to the man, but because of his innate sense of his own and his music’s roots. So when the song Dark As a Dungeon enters the arena, Paddy whisks me back to the early 1950s and a man called Charlie Tyndall who “went around all the fleadh cheoils singing these songs and later became one of my Three Squares” and then quickly forward to Vince Gill and the version that appears on The Chieftains’ latest CD. In his teens he won four All-Ireland championships on his traditional instruments, but also formed groups such as The Happy Wanderers and The Three Squares. The latter was a skiffle group, in which Paddy played both ukulele and washboard, but he couldn’t resist introducing the whistle or the pipes to play reels during songs such as ‘Putting on the Agony’ and other Lonnie Donegan classics. He formed and played in céilí bands such as the Lough Gowna and the Shannonside, but began putting together something a little bit different in the mid-1950s. “I was more interested in the combination of instruments. I could hear harmonies and would play counter-melodies, “he remarks, adding “which was a little bit off the beaten track for the purists.” The banjo-player Barney McKenna (forty of his own years with The Dubliners) was one of those first involved, but others were recruited from elsewhere on the traditional circuit, some as a consequence of Paddy’s involvement in Seán Ó Riada’s own experimental group, Ceoltóirí Chualann. The ultimate result was the appearance in 1962 of an album simply called The Chieftains (now universally known as Chieftains 1), but the band remained part-time musicians until the mid-1970s and the increasing success of their concerts, such as a sell-out St. Patrick’s Day gig at London’s Albert Hall in 1975, and the soundtrack for the film Barry Lyndon. The band’s last line-up change occurred in 1979 and Paddy’s fellow members consist of flute-player Matt Molloy (flute), the singing and bodhrán of Kevin Conneff, the harper and pianist Derek Bell and the fiddlers Seán Keane and Martin Fay (though the latter is now ‘semi-retired’). Irish Heartbeat, their immensely popular collaboration with Van Morrison, came in 1988, but it was the appearance of Another Country four years later which caused some traditional hackles to rise. Down the Old Plank Road will add further fuel to the debate about the impact of Ireland’s population diaspora on the world’s musical cultures. For Paddy, the links between Ireland and the USA are transparent, indeed he calls the new record his “blue-green-grass album, the blue and green grass of home, though I can’t imagine Tom Jones singing that.” As an example he cites first the centuries-old Irish song Rosc Catha na Muimhain (“The Battle of Munster”) whose melody seems to appear in various bluegrass numbers. One such is the song Don’t Let Your Deal Go Down, sung by Lyle Lovett on the album. 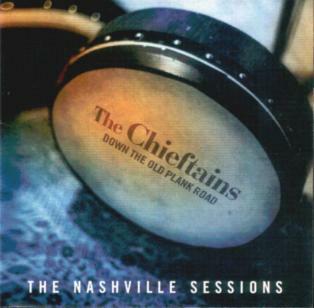 All the other thirteen tracks were recorded in Nashville with the likes of musicians such as Béla Fleck and Jeff White who’d arranged for the studio to be decorated in such a way that it was like “being back at your granny’s or in your own parlour.” Lyle, however, had come off second-best in a confrontation with a bull on his ranch and been hospitalised as a result, so Paddy popped down to Austen and Lyle made it to the studio in a special chair. Tracing and hearing the connections between Irish and American music also bore fruition in the appearance of the banjo-player Earl Scruggs whose wife apparently phoned Paddy to say “My Earl would like to come down and record”. As Paddy notes, “How could you refuse the likes of Earl Scruggs (or his wife)?” and Earl chose to play the tune Sally Goodin which features four or five Irish reels rolled together. Others appearing on the album include Ricky Scaggs, The Del McCoury Band, Alison Krauss and the more leftfield Gillian Welch. As for his plans for the future, well enough grand music came out of the Nashville sessions to release a second album next March and then there’ll be a tour with the musicians who took part. He’s continuing to compose soundtracks (recent outings include Of Gods and Generals and The Gangs in New York) and then there’s the ongoing solo album project. It’s more than thirty years since he was one of the uilleann pipers playing solo on the essential The Drones and Chanters and almost as many since the Tin Whistles album made with Seán Potts, so his own solo venture is long overdue. “Ah”, he sighs, harking to the pipes’ complexities, “if I could just get my reeds right”. This article by Geoff Wallis originally appeared in Songlines magazine – www.songlines.co.uk.